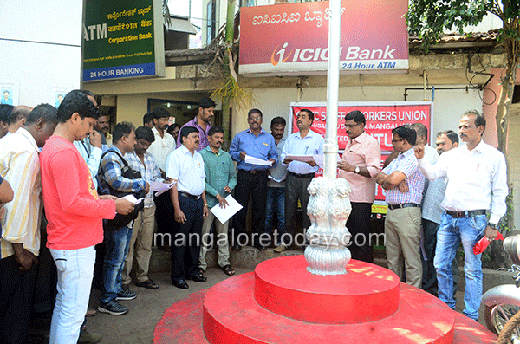 Mangaluru, Jan 25, 2018: Members of the KSRTC Staff and Workers Union affiliated to the AITUC staged a demonstration in front of the KSRTC bus stand at Bejai on January 25, Thursday in protest against the failure of the Chief Minister to fulfill the various demands of the employees. The protestors demanded cancellation of unlawful transfers and to reinstate the affected employees. They even demanded that all the four transport corporations should be merged as one and also to reinstate all employees transferred from Mangaluru and Puttur. Union office bearers G S Praveen Kumar, Vijay Kumar, Vinay Kumar and others took part in the protest.